Sweetheart is a 4-year-old pit bull currently living in a shelter in New York. The Dodo, took this sweet dog from the shelter for a day of pampering and exploring. In addition to a doggy spa treatment, Sweetheart had the chance to experience the ocean for the first time. Watch the video below as Sweetheart romps through the sand and splashes into the water, the excitement obvious on her happy face. She playfully attacks the waves as they come in towards her feet. She quickly learns that drinking the water isn't very tasty, but obviously enjoys the splashing and running. Sweetheart's reaction is akin to a small child's excitement. 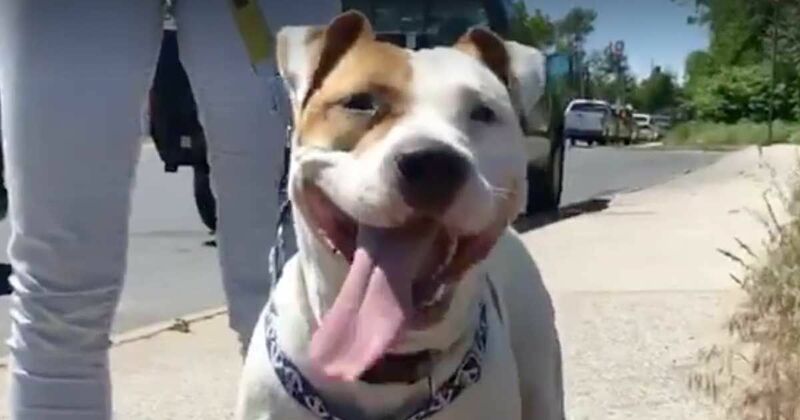 Sweetheart the adoptable pit bull is still having the best day ever. Watch her play near the ocean for the very first time! This sweet dog is up for adoption through the Sean Casey Animal Rescue. Sean Casey Animal Rescue is a non-profit, no-kill shelter. The shelter helps dogs, cats, birds, and reptiles find new homes. Bark Post reports that some 1.2 million dogs are euthanized every year and 40 percent of those dogs are pit bulls! Not only are they one of the most common dogs found in shelters, they are the most likely to be euthanized and only the third most likely to be adopted. Adopting a Pitbull can give the dog a second chance at life. This is especially true of older Pitbulls, as many families are searching for a puppy or smaller dog. Many people falsely believe that getting a puppy is a better idea because they think puppies will "bond better," than adult dogs. Happy Pit Bull debunks this myth. "All dogs, young and old, want to be part of a family ... an older dog will soon act as if he has lived his entire life with you. Whether you get a puppy or an adult 'bonding' depends on what you do with the dog and how you treat it." To learn more about adopting this "sweetheart" or another dog like her, visit Sean Casey Animal Rescue.